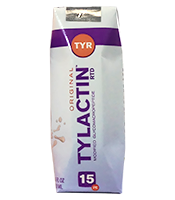 Tylactin RTD is the first and only whole protein TYR formula in a ready-to-drink format for the dietary management of TYR types I, II, III. Tylactin RTD is a medical food formula which contains Tylactin, the proprietary, advanced formulation of glycomacropeptide and essential amino acids without added tyrosine and phenylalanine. Phenylalanine is not added because phenylalanine naturally converts into tyrosine. you will not believe it is formula! Contains 15g protein equivalent (PE) per carton.